Broadcom is ushering in a new generation of Wi-Fi technology with the release of its first gigabit-speed 802.11ac chips. The company says the new chips are aimed at enabling higher-bandwidth services like HD movie streaming over wireless connections. They are up to three times faster, deliver 40 to 60 percent better range, and are up to six times more power efficient than similar 802.11n solutions. Broadcom is marketing the technology as "5G Wi-Fi," though it's unclear if the networking industry will adopt the same terminology to promote 802.11ac. The top tier BCM4360 supports the PCIe interface and uses a three-stream implementation, reaching as high as 1.3 Gbps of throughput. The BCM4352 and BCM43526 support PCIe and USB interfaces, respectively, and use a two-stream 802.11ac implementation that can reach up to 867Mbps. Lastly, the BCM43516 chip also supports USB interfaces, but uses a single-stream radio that can reach speeds of up to 433Mbps. By comparison, even multiple-stream 802.11n devices don't typically surpass 300Mbps. The Wi-Fi Alliance is not expected to formally ratify the 802.11ac specification until sometime around Q4 2012. However, much like it happened with the transition from 802.11g to 802.11n, users will be able to buy "pre-standard" hardware early in 2012 without worrying about compatibility issues when the standard is approved. 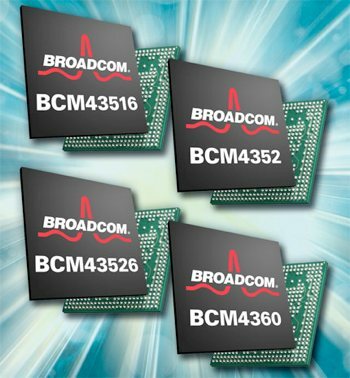 According to Michael Hurlston, senior vice president and general manager of Broadcom's wireless LAN division, early products should be upgradable in the field to the final standard. "I'm confident that any changes to the spec beyond this point and before final ratification will be be window dressing, and relatively small [...] History is a very good guide, and we feel that history will repeat itself," he said.